Like something out of a Hitchcock movie, they're lined up along the rooftops of buildings, on parking lots, on grassy plots, on the gravel wasteland left behind by demolition of the Park East Freeway spur. Gulls. They're everywhere, it seems - and so are their droppings. BRIGHTONâ€”The double-crested cormorant is facing lethal force for the first time on the Great Lakes since it recovered from near-extinction 30 years ago. On the Ontario side, parks officials are halfway through a cull of the birds that congregate on High Bluff Island, a bird sanctuary off Presqu'ile Point, while 175 kilometres to the east, New York State officials are shooting birds on Little Galloo Island. Whether the cull will be effective in controlling the birds' expanding numbers is anyone's guess, says federal cormorant expert Chip Wiseloh of the Canadian Wildlife Services. For Michigan mosquitoes, soggy weather is like an all-inclusive package at a racy resort -- free food and drinks, luxurious waterfront lodging and fertile opportunities for procreation. So, expect a skeeter baby boom next month. Pity these poor lost birds. A little lousy weather, a few inconsiderate humans and next thing they know, they're stuck in southwestern Michigan, wondering how the heck they can get across that big pond back to their summer home in Wisconsin. We're talking about six whooping cranes, a bird that has come to symbolize international efforts to save endangered species. Perhaps on its way back from San Francisco Bay to Whitefish Point in the Upper Peninsula, a male Canvasback duck was spotted last month paddling the waters of the AuSable River. Humans, it seems, have always been birdwatchers. Our history is filled with accounts of the power and beauty of winged creatures. The Greek, Egyptian and Arabian cultures tell often of the immortal phoenix that could rise from the ashes. And Native American mythology holds that the Thunderbird, able to make itself invisible and traverse the heavens, gave rise to all other birds each time it lost a feather. Eagles came from the largest quill feathers of the Thunderbird, partridges from smaller feathers, robins and pigeons from the down and hummingbirds and sparrows from the mere, fuzzy filaments on the down. Bald eagles, hungry coyotes and buzzing power lines are the anticipated perils of young, eastern whooping cranes embarking on their maiden - non-human-assisted - spring migration. But as researchers, volunteers and avid whooper watchers have discovered, there are a couple of new obstacles to add to the list: Lake Michigan and litter. COLUMBUS - A record-breaking 105 bald eagle nests have been verified by state wildlife officials so far this spring in Ohio, according to the Ohio Department of Natural Resources Division of Wildlife. "Reaching the milestone of 100 eagle nests is great news for Ohio, especially considering that only 25 years ago, eagles were nearly gone from our state," said Steven Gray, chief of the Division of Wildlife. "The bald eagle's success is a good indicator of how habitat in Ohio has improved and of how eagles have adapted." A decline. In 1979, there were only four bald eagle pairs nesting in the state. Pesticides and loss of habitat were major contributors to the eagles' population decline. In response to customer demand and concern about mosquito-borne diseases, Atlanta-based Orkin, Inc. is now offering a new service to help homeowners control mosquito populations this summer. Orkin is the only national pest control provider offering mosquito control service. Orkin's three-pronged mosquito treatment service is available in more than 80 cities to help reduce mosquito activity in residential and commercial settings. The treatment begins with an inspection of potential breeding sites. Following the inspection, larvicides may be used in standing water, such as ponds or other water features in the landscape, to stunt the growth of mosquitoes' offspring before they become biting adults. Fishermen have blamed double-crested cormorants for the decline of yellow perch in Green Bay for nearly a decade. Beginning this year, theyâ€™ll find out whether thereâ€™s any truth to their suspicions. The U.S. 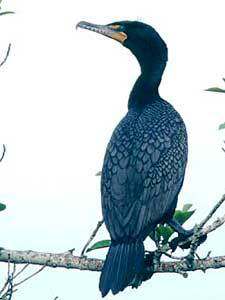 Fish and Wildlife Service has adopted rules to allow state fish and wildlife agencies, federally recognized tribes and U.S. Department of Agriculture wildlife services to kill cormorants when the birds are harming public resources. A Lake Erie water snake recovery implementation plan is among the projects receiving grant funding from the Ohio Department of Natural Resources Division of Wildlife. The project, headed by Richard B. King of Northern Illinois University, was awarded $20,000. Anglers have been complaining for years that a burgeoning cormorant population on the Great Lakes is destroying perch and smallmouth bass stocks. Now they have support from research scientists. In co-evolution, living things develop strategies over hundreds or thousands of years that let them inhabit the same area, sometimes through mutual benefit, sometimes through a mutual standoff.